It is awful to stand by and watch a baby suffer with eczema. That’s why it’s worth trying a range of treatments for baby eczema, including oral probiotics and other beneficial supplements, to see what works best. Although the following supplements are generally good for overall health, always consult with a doctor and most importantly if baby experiences any adverse effects discontinue use. Research offers promising evidence that probiotic supplementation might help treat baby eczema and other allergic diseases. Bacteria play an important role in eczema and in the overall health of the skin. Also, bacterial flora is very different in patients with atopic dermatitis, so the idea that adding back healthy bacteria is a very useful treatment. 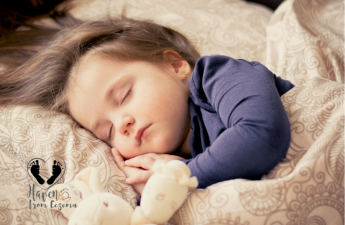 Studies have found that with probiotic supplementation, babies and children with eczema experienced better sleep, and reduced symptoms. In an infant’s early life, this gut balance can be altered but by the age of 2 years old, the gut flora becomes static. This means that if your child develops eczema as an infant, you have until the age of 2 to repair the gut for life. That’s why its also highly recommended to continue to breastfed past the first year. After 2 years old, you can influence the microbiome by supplementing with probiotics but you can never change the balance long term. This information is also really important for mom’s who are pregnant. Research shows that mothers who take probiotics during pregnancy are less likely to have children with eczema. Probiotics are also highly recommended to babies and children after they that have taken a course of antibiotics, been ill, had diarrhea, experience food allergies and sensitives, or to treat compromised gut function or candida albicans fungal infestation. When is the best time to begin giving a child probiotics? C-section babies should start on the first day of life. 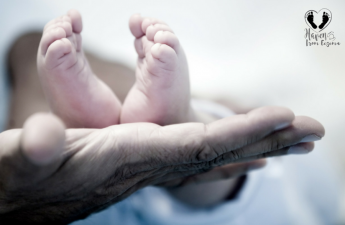 Babies born to mothers who have been on many antibiotics and have a family history of eczema should also start early. Babies experiencing eczema symptoms and other allergy symptoms should also start as soon as possible. Which Probiotics Strains to Choose? The beneficial bacteria in probiotics come from two groups, Lactobacillus (often shortened to “L.”) and Bifidobacterium (shortened to “B.”). Within these groups are different strains such as Lactobacillus acidophilus (L. acidophilus) and Bifidobacterium animalis (B. animalis). The strain known as L. rhamnosus GG have been commonly known to improve eczema symptoms in up to 50% of children with eczema. Another study have found two more probiotic strains, Lactobacillus paracasei and Lactobacillus fermentum linked to improving eczema symptoms, with the benefits remaining for a month after stopping the probiotic supplement. While there are specific stains that help improve eczema there are also strains that can cause inflammation and eczema to worsen. Research indicates that some probiotic strains like Lactobacillus casei and Lactobacillus bulgaricus generate histamines, which can aggravate eczema. So if you believe your baby is sensitive to amines, histamines and/or MSG consider giving a probiotic without Lactobacillus casei and Lactobacillus bulgaricus. Also, if your baby is allergic or sensitive to milk/lactose/dairy, then choose a strain that is not of bacteria from milk, as it may make the eczema worsen or trigger a breakout. 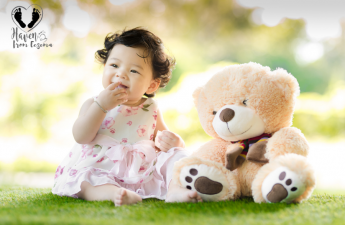 What are the Best Infant Probiotics? The following probiotics are specifically designed for infants and contain the beneficial strain(s) that reduce eczema symptoms. Best of all, they do not contain gluten, dairy, sugar, soy, egg, fish, shellfish, peanuts and tree nuts! 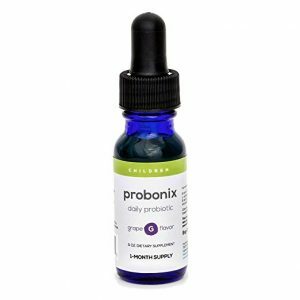 Probonix Children’s Liquid Probiotic Drops has been rated high in quality as well as in helping treat baby eczema. It contains L. rhamnosus among other strains, B. bifidum,B. infantis, L. reuteri known to help with gas, colic, constipation, lactose intolerance and much more. 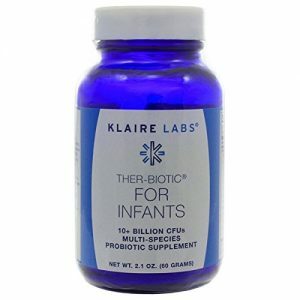 Klaire Labs Ther-Biotic Infant Formula Probiotic Supplement. Klaire Labs is the most recommended brand by healthcare professionals and has a comprehensive selection ranging from 3 billion to 100 billion CFU per serving with the flexibility to select the right probiotic for individual needs. 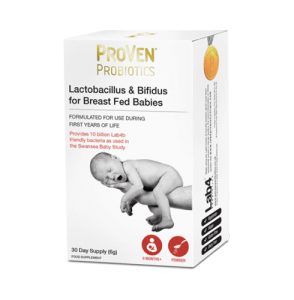 Proven Probiotics Lactobacillus & Bifidus for Breast Fed Babies up to 12 months of age. Proven Probiotics is the most studied in the UK and has been involved in research into various areas that include immunity, digestion, antibiotics, mood and performance. There is also has a formula line specifically designed for formula-fed babies, however, the probiotics do contain milk. 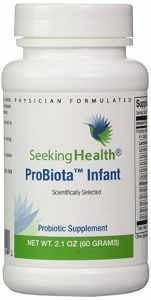 Seeking Health ProBiota Infant Probiotic Supplement. Seeking Health vitamins and supplements are held to the highest standards for manufacturing processes and quality. The company mission is to educate people on how to approach their health through dietary, lifestyle, mental and nutritional needs. Be sure to follow the directions on the product label and follow proper storage (i.e. probiotics be refrigerated for long-term storage). The concept of “rotating” probiotics had gained considerable attention among both clinicians and patients. Probiotic rotation involves using a particular type of probiotic for a period of time, switching to another strain, species or product for a similar time period, and then returning to the original or even a third probiotic. This concept of rotating probiotics arose more than a decade ago in response to reports of certain types of probiotics being ineffectual or losing efficacy over time. Thus, by adding new strains of probiotic organisms, it was believed, might increase biodiversity in the gut and more effectively antagonize intestinal pathogens. This is no longer relevant in the era of high-potency, multispecies probiotic formulations. When the concept of probiotic rotation first emerged, most probiotic formulations contained relatively low numbers of organisms and many were comprised of only single strains. Data indicates that positive clinical results are achieved by using probiotic products with adequate colony counts and a broad spectrum of species. Notably, no published study has ever demonstrated a benefit from rotating different probiotic products. The American Academy of Pediatrics recommends that all babies receive routine vitamin D supplementation (400 IU per day). While adequate amounts of vitamin D can be achieved through baby formula, breast milk alone does not provide infants with an adequate intake of vitamin D.
And although most breastfed infants are able to synthesize additional vitamin D through routine sunlight exposure, there is a major public health effort to decrease a baby’s risk of skin cancer by limiting sunlight exposure. Lower vitamin D levels have also linked to more severe eczema symptoms. Other studies also have shown that children with eczema who have low levels of vitamin D are more likely to have other skin problems, such as increased infections, compared to children with eczema who had higher levels of vitamin D.
Furthermore, vitamin D may help the immune system reduce levels of inflammation, strengthen and repair the skin barriers. While taking vitamin D alone will not help prevent or treat eczema, vitamin D supplementation is necessary especially for a breastfed baby. There are many brands out there, but we found Nordic Naturals Vitamin D Drops to be our favorite because they are trusted for their quality. If the breastfeeding mom consistently eats a reasonably-well balanced diet, vitamin supplementation is not considered necessary. However, if breastfeeding moms eat an average American diet, supplementation such as calcium and zinc is still good for mom’s benefit. 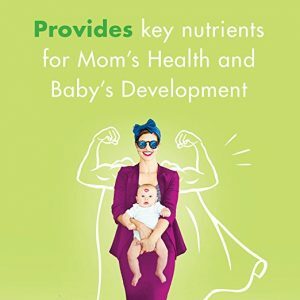 Supplementation is encouraged for breastfeeding moms who are in elimination diet/food challenge, who eat no animal products, who have little exposure to sunlight and who smoke cigarettes. If your baby has a gluten, milk, shellfish, or soy allergy, its best choose a multivitamin that is free from all of these. Food based vitamins Rainbow Light One Prenatal are vegan and contains no eggs, fish, gluten, peanuts, shellfish, soy, tree Nuts, wheat. 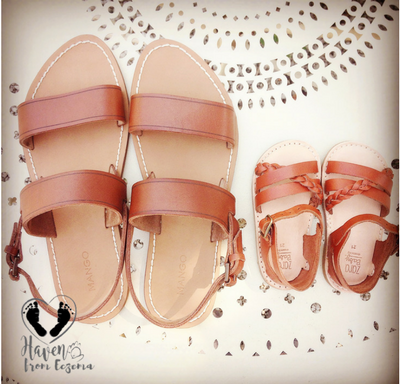 I supplemented with Rainbow Light when I was pregnant and while breastfeeding. Fermented cod liver oil to treat baby eczema is not well studied, but evidences from available studies and users’ testimonies confirm that FCLO can help. For some, it is the only thing that really helped clear the eczema. FCLO contain DHA and EPA which are highly recommended forms of Omega 3s. Omega 3 has been known to reduce inflammation, one of the symptoms of eczema. Furthermore, there is an extended list of benefits of FCLO such as: promotes mental health, promotes healthy hormone balance, supports the health of hair, skin, and nails, helps manage ADHD symptoms, helps manage inflammatory lung conditions (asthma) and many more. FCLO can be taken while nursing or given directly to infants as young as 3 months old. The best brand out there for FCLO is Green Pastures. They manufacture in the US and make several different varieties in liquid or capsules. 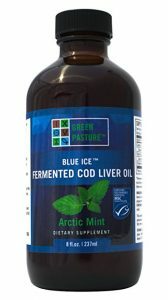 Those allergic to all fish products should NOT take cod liver oil. When trying a range of treatments for your baby’s eczema, its important to know what doesn’t work and what works best. The Treatment Preferences template below is an ideal example that can be used record your baby’s treatment preferences and to keep for your records. Ideally, in treating baby eczema, it is best to take all of these: 1) probiotics supplementation (to prevent future allergies), 2) vitamin D (to repair skin barrier), 3) fermented cod liver oil (to reduce inflammation), and 4) multivitamins for the breastfeeding mom (if on an elimination diet). But the bottom line is that most supplements are expensive. If you only decide to choose two supplements, they should be the infant probiotics and vitamin D (if baby is breastfeeding).